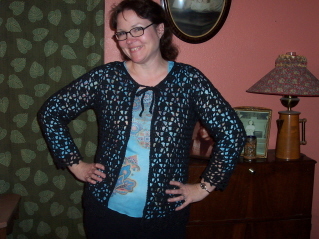 Pattern: "Lacy Top Cardigan" by Doris Chan from Tahki Stacy Charles "Crochet" Spring, 2007. 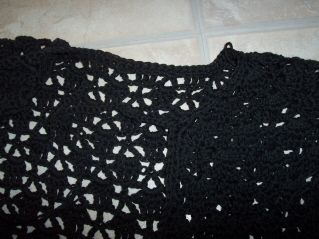 Yarn: 5 skeins Lily Cotton in black. Mods: I made it a few inches longer than called for and I changed direction on the front edging so I'd be ending with a RS rather than WS row. I have long arms so to have the sleeves be as long as the pattern, I would've had to add another 4 pattern repeats but I didn't bother. 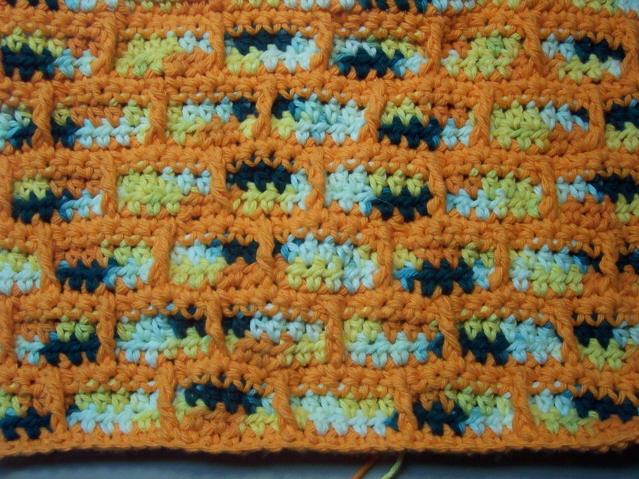 Mistakes: Once I got past my own user goof, I only found one mistake in the row stitch pattern. It's not a big deal and once you get there you'll know exactly what to do so I'm not going to write it out. 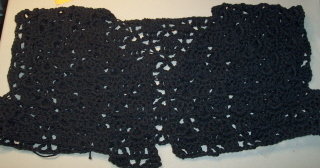 Ease of crochet: Once you get the pattern going correctly, this is a breeze. The size of the hook and the worsted yarn make this one go very, very fast. For all you Cotton Ease lovers out there - this would be a perfect project for our favorite yarn. Judging by the Lily yardage, you'd need 5 to 6 skeins of CE, depending on your size. Speaking of school, I didn't have the "zoo" yesterday after all. Turns out I was really there to cover teachers going to IEP meetings. But it didn't go as smoothly as in past years. The head of the Spec. Ed. department left a couple of weeks ago and she's the one who scheduled all the substitutes for each teacher. Each of us would cover 4 to 5 different teachers throughout the day. However, yesterday there were subs waiting but no schedules! Too crazy for words. I ended up covering 3 IEPs and a period for a teacher who went home with the flu. But at least I didn't go to the "zoo!" Regarding the boy I told you about yesterday & Dylan's part in it: The kids were interviewed again yesterday and the tables were turned. The officer who interviewed Dylan told him he must be lying, that he would press "charges" against Dylan for doing that and for "covering" for a student who regularly brought weapons to school. He asked Dylan if he wanted to wait until there was "another Columbine" before coming forward. You have no idea how angry I am at this. You know why he was hard on Dylan? Because Dylan wouldn't back down & looked him in the eye and insisted he was telling the truth. Dylan said he could tell the officer was getting pissed because Dylan wasn't acting like a frightened child. Eventually he backed down, though, because the officer just kept at him about it and Dylan said that finally he made him feel about 2 inches high. Because I don't want this to turn any uglier than it already is, I'm going to withhold any comments I might have unless they (the admin) keeps hammering at the kids. Hopefully this was it and they have enough info. No wonder kids don't come forward if this is how they're treated! I also made this about 4 inches longer than suggested, maybe a bit more. I didn't keep track, just tried it on as I went. (Ignore that one bit in the center where my stitch count went wonky for a row.) This is fun to do & looks really great. It's Wendy's crochet answer to the knit "Ball Band" dishcloth. When it's finished, it'll go in my "fall kitchen" stack. It matches the tea cozy & dishcloth I've already made. This was back-ordered on Amazon for a couple of months & it finally arrived yesterday. I haven't had time to even flip through it, so I'm looking forward to a bit of reading today. I'll be subbing 6th grade English today so I know I'll be able to read a bit. 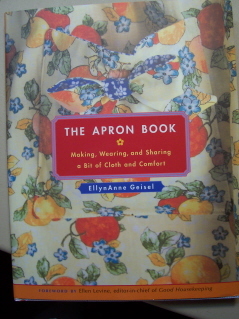 And yes, I'm still planning on making a pattern for my Mom's apron. In fact, I'm really itching to do some more sewing. Every day as I sit at the computer, my sewing machine sits right beside me, tempting me! Have a happy & blessed first day of spring....whatever the weather! 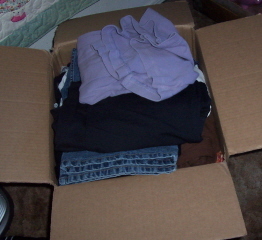 It's a box of clothes that I've gotten from eBay off & on over the past year. Mostly jeans - about 15 pair of jeans I think - and other bottoms. I didn't buy them specifically, they came as part of a "lot" of clothes. I was really going for the tops or dresses that were included, the pants were extra. All those pants should fit. You want to know why they don't? 'Cause I have a fat *ss. You know why my *ss is so fat? 'Cause I have a lazy *ss too that doesn't want to exercise. I could have a closet full of cute clothes if only I could drag my.....wait for it.....sorry *ss over to the exercise bike & get back into the swing of things. The real mistake is in the section where it tells you how the pattern rows go for the straight sections, working in the round and the taper. I'll list the correction when I do my end notes for this cardi - which should be in a couple of days 'cause this is a FAST crochet! 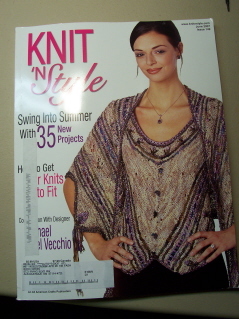 I liked a couple of patterns, which I'll talk about later, but I really have to say that my biggest beef with Knit N Style is their habit of putting really awful items on their front cover. There are usually bright stripes & some sort of fun fur involved. Yuck! You're supposed to entice the reader into opening the magazine, not turn them off from even picking it up! 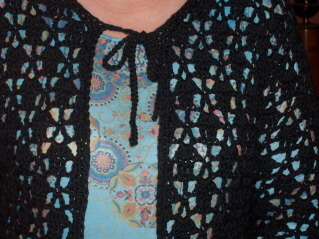 Next up: Reviews of Lace Style and the June "Knit 'N Style." 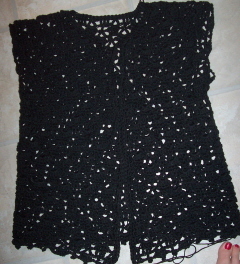 Then the unveiling of Lacy Top Cardi.